I have been monitoring the Jan-Feb 2009 Victorian bushfires from NSW and have turned my attention to the bushfire management in a natural area – Wilsons Promontory. I note satellite observations of the fire with concern showing the lighting ignition on the east coast started 9th February, but had almost extinguished itself by the 13th. Then a wind change drove it out of control. A week later it has burnt out 22,000 hectares (almost 50% of our precious 50,000ha Prom)! While the Country Fire Authority (CFA) has paid special attention to non-imminent bushfire risks to rather distant private property. The CFA says “the fire does not currently pose a threat to the Yanakie community.” Backburning the Prom is given as the only bushfire response strategy. So do we interpret this as a noncommittal response by the CFA for the Prom – that is since no human lives or private property are at threat, the CFA’s bushfire response is to just ‘monitor’ the fire and put out the spot fires threatening private property to the north? The CFA reports read as though CFA policy for active and damaging bushfires in important conservation areas is to wait for rain, but otherwise ‘let it burn’. And yet the Bureau of Meteorology forecasts hot and windy conditions for tomorrow Monday, 23 Feb 2009. 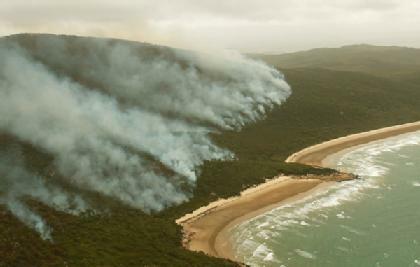 Wilsons Promontory where thousands of hecteres have been burnt. I interpret this bushfire management by Victoria’s CFA as one that respects only human life and property, but does not rate the natural asset values of fauna and flora habitat of the Prom with any respect. It seems at best an opportunity for de-facto hazard reduction that it would normally not get permission to do, and at worst an inconvenient distraction for CFA crews. If this is the prevailing attitude of rural firefighting then clearly the CFA has no interest in natural assets, and no mandate to protect them from fire in the same passionate way it does private property? There seems no difference in approach or skill set by the CFA to that that would be exercised by urban fire brigades. So why do we have a Country Fire Authority? Because professional fire brigades are expensive. Government has a bet each way. If the local volunteers put out the fire and save lives and property, they are heros and the organisation is justified. If the local volunteers fail and people die, governments defend the local volunteers for doing their best and reject criticism of fire fighting as criticism of local volunteers, and pleads the unAustralian line. Such has become the politics of negligent government. For decades hiding behind the ‘Volunteer Firefighter Facade has proven effective in persuading a gullible media, so the policy and practice perpetuates in absence of an independent public watchdog. Public class action for damages is long overdue. On this basis, it is overdue for the CFA to be incorporated within the urban fire brigade structure. While this initial structural change won’t save Victoria’s vast tracts of wildlife habitat in the short term, it will sure will remove the false premise to the community that the CFA respects and defends natural wildlife habitats. 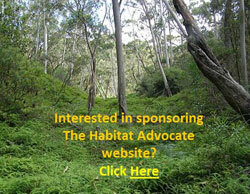 What does Victorian Government’s Department of Sustainability and Environment have to say for itself? It is charged with the Promontory’s protection. See also: “Crews unable to slow Wilsons Promontory blaze” on ABC online on 17 Feb 09, “Huge blaze threatens the very heart of the Prom” in the Age of 19 Feb 09. This entry was posted on Saturday, July 9th, 2011	and is filed under Threats from Bushfire.